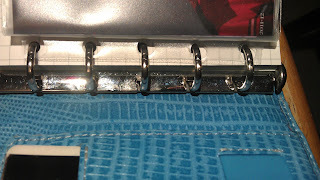 I bought a 'wallet window'' (the plastic thingy that you stick in your wallet to hold photos and credit cards) from RiteAid. I looked all over town for that sucker! CVS, Target, Walgreen's, Claire's... finally found it at RiteAid - the last one on the shelf! Two per package. Now that I know what they are called, I can look online next time. 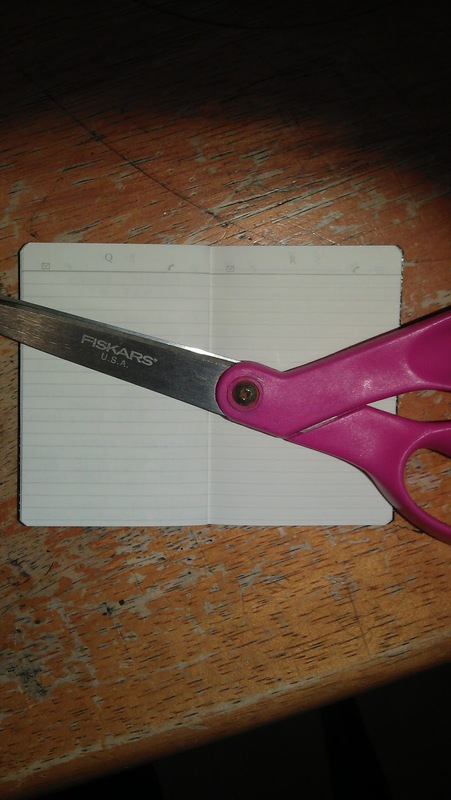 Anyway, I cut off most of the part that is used to secure the window wallet in your wallet and then punched holes with a single-hole punch. If I do it again I would leave a little more plastic, I just eyeballed and had at it. Typical. A ruler could have been a good idea. This photo, below, shows just how little I had leftover. Notice how close the holes are to the edge. Might tear at some point. Will then use my backup. 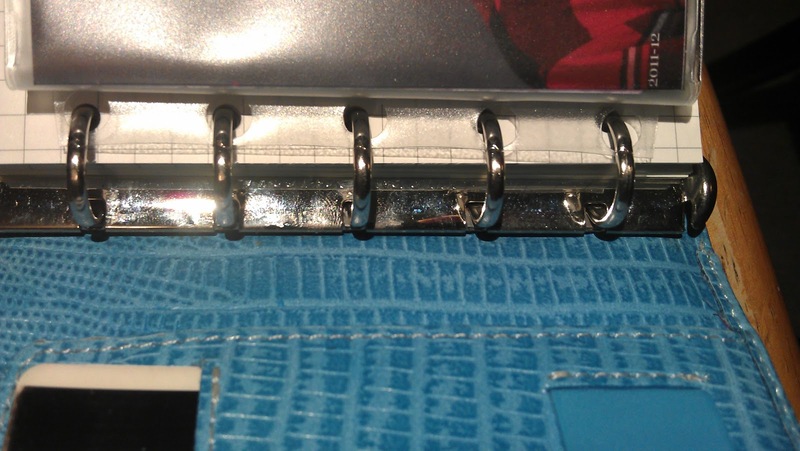 This is an open view, below, of the little staple-bound Leuchtterm address book that is visible in the wallet window in the first photo (black cover). It's so small it fits in one of the windows. Cool, huh? It only has my most critical phone numbers in it, family, AAA, etc. Just in case I lock my phone and keys in the car and have to borrow the phone inside my favorite Filofax store to call the tow truck. Not that that has ever happened. You.Are.So.Smart! I have a mini Raspberry Fins that I simply must try this hack with this summer. I recently purchased my first mini. What other things do you use your mini for? I'd love to hear about your set up! 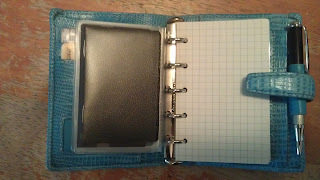 My mini is very limited, I use it strictly for a wallet/notepad. 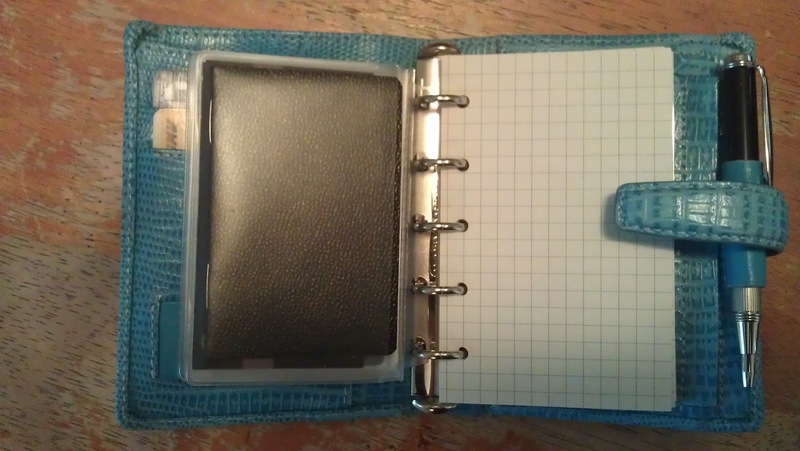 I have another wallet that holds a teeny notepad and pen, but I just love the look and feel of this one, so I put it to use. The bulk of my planning/organizing/project-tracking is in my personal-size Amazona. ONE day I do a photo shoot starting my Amazona but I'm so crunched for time right now - UGH!! Will be better after I finish two large jobs - deadlines imminent! I now have 1:27 minutes left of my break on my pomodoro timer! (the 'Tomighty' - free download). Make it 1:01. P.S. The pen is an expandable pen by Zebra. Perfect. I admit, my mini has come in VERY handy for notes. However, I'd like to make this my portable info carrier, although maybe not my only one. I use the compact Zebra F301...and I quite agree. It's perfect! Thanks again for the post! And I look forward to your Amazona profile...ahem, hint, hint! Jane - I doubt I will ever be able to use a mini as an info source because I like to SCRAWL. BTW, yesterday I took only my mini into the store when I went clothes shopping so I could leave my huge purse in the car. In order to keep my keys and wallet together I opened the rings of the mini and then hooked my key ring through that. I then carried the whole thing in the in-store shopping bag. Let us know when you figure out how to purpose your mini! I'm at this moment enjoying some Sunday morning time printing out some info pages to carry in my car in my new pocket-sized Fresco. Details forth-coming!